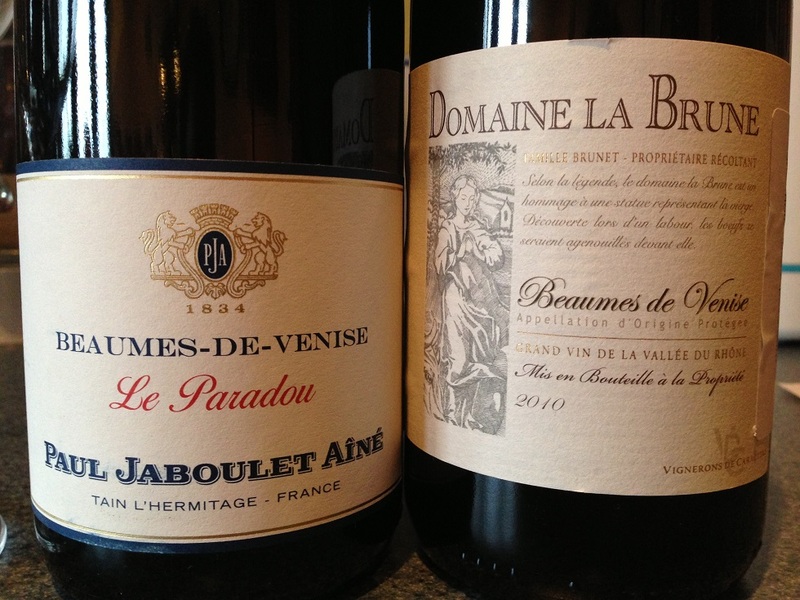 If you look at any wine list with a sweet section, you have a better than evens chance of seeing Beaumes de Venise. But, it is rare to see reds from this Rhone village, especially in UK and US restaurants. I’ve been ordering a Jaboulet BdV en primeur for years. At about £10 a bottle it stinks of value to high heaven. A fresh young juicy red that goes great with spicy pork or lamb dishes and is generally best drunk within a year or two of receipt. With ‘spooky coincidence’ written on the packing receipt, a few days before my annual Jaboulet instalment arrived from the 2010 vintage, a sample of another marque arrived. I like taste tests. Take your pick, or explore other BdV reds. Maybe you will find Geri or Victoria. I paid The Wine Society £11.28 per bottle (en primeur) for the Jaboulet. The Domaine de la Brune is available from Christopher Keiller at £117.50 per case (equiv. £9.79 per bottle). This entry was posted on Wednesday, April 24th, 2013 at 9:12 pm	and is filed under Rest of France. You can follow any responses to this entry through the RSS 2.0 feed. You can leave a response, or trackback from your own site. Hvae been going to Domaine de Durban for years. Their Muscat is unrivalled, and their reds ( also a cuvvee prestige) are to be recommended. Lovely property to visit too. I didn’t have the chance to try this wine in US but other wines from France or Argentina are available to the adventurous palate. Salud!